Hi I am an unqualified gardener & been gardening for nearly 45yrs. I live in Australia at a place called the Riverland which has hot dry summers average temp 37c , short mild winters with extensive frosts. 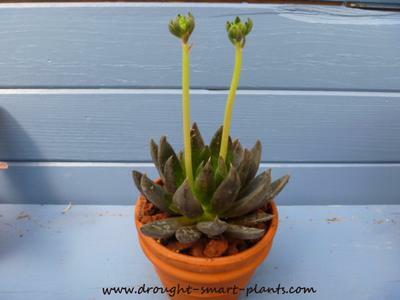 My question to you is would you be able to explain why some of my leaf cuttings of Echeveria Black Knight have resulted in variegation of pink, white & green instead of black? I put in about 50 leaf cuttings about 2 months ago, late winter for us. Yesterday I noticed 1 little pup growing out of the black leaf with this variegation. On closer inspection today I noticed some which are not going to black either. Most of the young plants still attached to the leaves are black but there are about 5 that are going to be different. It seems there are too many for it to be chance mutation. It is not a nutrient deficiency, and they are in a well lit position. Do you think they will change to black later when more mature or have they mutated in some way to something different? I always thought when propagating vegetatively they would all be the same as parent. I know plants can sport mutations but most are the result of hybridising or from seed. The leaves I used were from the flowering stem & really small compared to the adult leaves. I have asked a friend of mine who is a cactus nut & he says he had never heard of this happening. i will take a plant along to the next cactus/ succulent meeting for some more answers. If you could provide any insight with your wisdom or just one of the universes many mysteries. One cause of mutations such as you describe is a virus which makes the cells at the place the new growth emerges go in weird and wonderful directions. In some cases the virus is not a problem, and stays in the plant, not transferring to others. It isn't always that way though! Some viruses are transferred to other plants by insects (usually aphids) or by tools used to propagate them or for pruning. I wish you had provided an image or two with your submission - I want to see this!